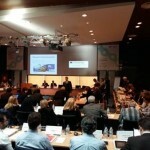 The FIBA Europe UNIVERSITAS team and the European Observatoire of Sport and Employment (EOSE) came together for the first time in Munich, Germany on 12th October 2011. This meeting gave the opportunity to present an update of the activities and missions of both organisations and also to start the discussion on future collaborations in the field of Education and Training. In attendance were FIBA Europe Secretary General Nar Zanolin, FIBA Europe Head of Operations Miguel Betancor, Alejandro Vaquera of UNIVERSITAS and Alan Richardson from the FIBA Europe Referee Department. Aurelien Favre (Executive Director), Ben Gittus (Director of Standards) and Matthias Guett (Research Manager) represented EOSE. 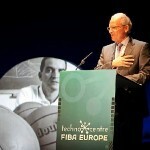 “This was really positive to meet with FIBA Europe about our future collaboration in the FIBA Europe Universitas. EOSE is pleased to contribute to the development of education and training for basketball in Europe, and the increased profile of basketball at the European level” commented Aurélien Favre. 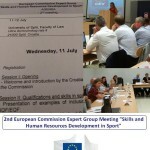 “It is encouraging that the development of occupational standards is one of the areas of work where there can be a partnership between EOSE and FIBA Europe. Occupational standards provide the building blocks for all areas of education and training including education licensing systems. 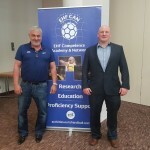 We look forward to supporting education in basketball to link to the European Qualifications Framework and best practice in sport education” concluded Ben Gitus. From the discussion, EOSE is now going to develop and submit to FIBA Europe a concrete proposal to focus on the following 3 topics: Research in Basketball, European Networking and Policies, and Standards Development.